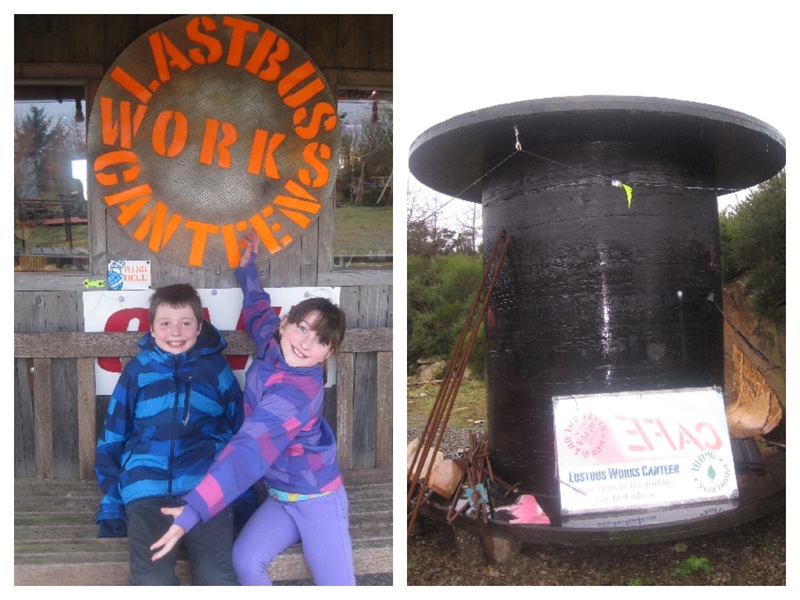 Prior to our our Glamping trip last weekend I asked our High Seas Hobbit Hostess Carole for any recommendations of where to eat in the area and she tweeted me " there's a really cool place called The Last Bus, its in the countryside nr New Pitsligo, very quirky + super cheap" So I Googled and found the Lostbus Works Canteen and instantly knew it was right up my street and we absolutely had to visit. There is no way you would stumble across this place. A true hidden gem in the back of beyond. We struggled even with directions but the sat nav did the trick leading us all the way to a disused quarry. Even on a soggy, wet and cloudy day the setting and structure was impressive. Inside was no less spectacular and we got such a warm welcome in its cosy interior. 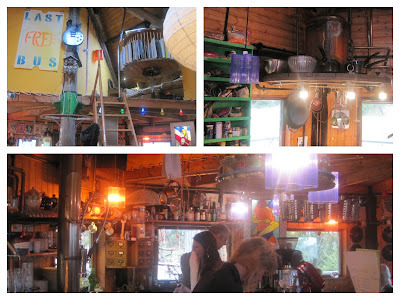 The decor could be best described as eclectic. But even that doesn't do it justice. It's a quirky little word of its own. Well worn bus seats, gramophone, train set running round the ceiling, cuckoo clock, road signs, posters, vinyl records, huge assortment of musical instruments, christmas decorations, kitchenalia. A game of eye spy would be near on impossible. The menu is 100% vegetarian (may possibly even be vegan?) but you certainly don't miss the meat. 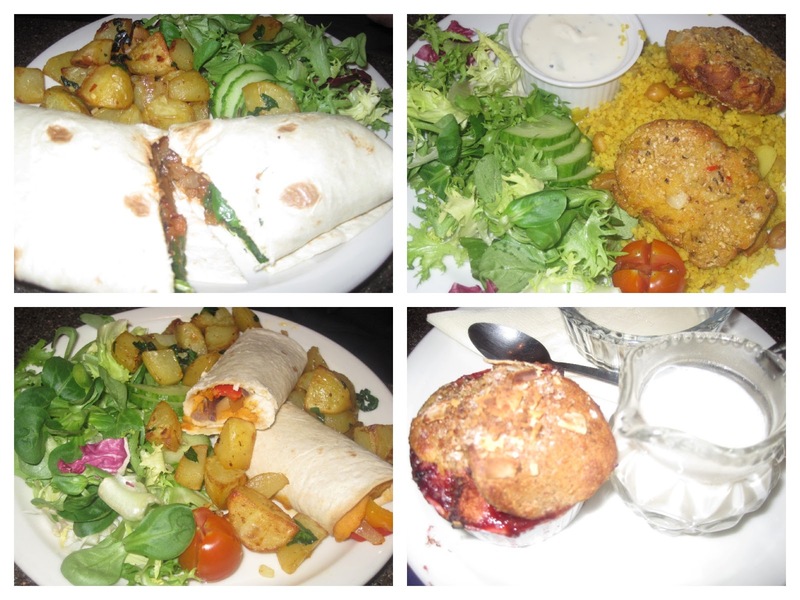 Between us we opted for chilli wrap, falafel & ratia, sweet potato wrap, apple and berry pie with soya custard plus muffin and yoghurt, coffees and hot chocolate. All were absolutely delicious and very reasonably priced. The staff could not have been more laid back, attentive or welcoming. Boy and Girl were treated like guests of honour and are desperate to return. The visitors book and TripAdvisor reviews tell exactly the same story. My absolute favourite feature was the cutlery carousel. A rotating knife, fork and spoon holder made from an old bicycle wheel. 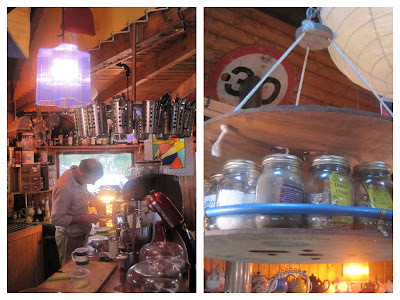 I am seriously considering designing my dream kitchen around one. They had a similar set up with an old cable reel for herbs and spices. After the whisky barrel toilet at High Seas Hobbit the funky circular outdoor loo at the Lostbus didn't phase us at all. The whole area surrounding the cafe was full of strange buildings and abandoned vehicles. There's even a recording studio and two converted double decker buses on site. Next time we're going to ask for a guided tour. Different, special, quirky, unique, magical, surreal, random. If you're not sure what to expect go with an open mind. I guarantee you will love it. I only wish we lived closer. Get the sat nav out and plug in AB43 7RA. It's a real "hidden gem"
Alas its a wee bit too far away to become a regular haunt but will definitely revisit when were are in that neck of the woods. Nope I haven't, i'm a bit too fussy for veggie meals but my sister lives at the top of the road it's on so we might pop in for coffee in the easter hols. You describe it brilliantly Claire, and you're right - once you've been you just want to go again. There's so much to take in, I love it! Thanks so much for telling us about it Carole. Would never have come across it otherwise.